Poo Doo Leash - Pet Waste Carriers Are you ready for spring? Ugghh!! Winter always leaves the Poo Doo Crew a little down, hence the reason for a delay in the monthly newsletter! We needed some time here at Poo Doo headquarters to gear up for 2017. Now that Spring is upon us, we have great plans for the season. Thanks to awesome customers, such as yourself, we doubled our sales at local arts and crafts festivals in 2016 and are looking to expand further! We also have a new addition to the Poo Doo Crew- Arlo- he is the handsome one on the far left. He has been hitting the festival circuit with us and is a big hit. Due to expansion, we joined a crowdfunding campaign called “I Fund Women” to help with our next big endeavor! 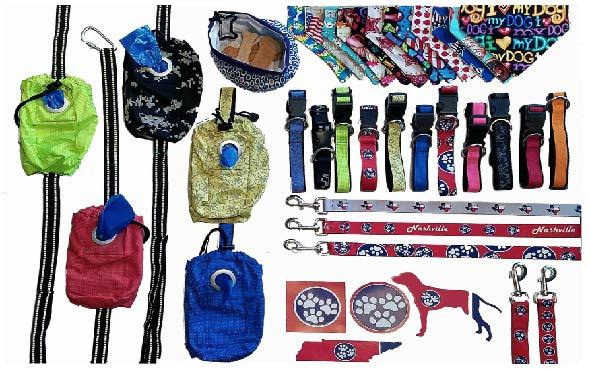 Poo Doo Leash and State Paws products will be at the lowest cost ever for the next month on this site. Please go to our funding campaign to pick up amazing products at great prices. We need your help. Spread the word! On the Poo Doo Leash home front, we have released our newest “Back-Pack” design line. We now have this line in the Hands-Free leash, the Poo Doo Pouches and in zippered portable water/food bowls. We had many requests for zippers to be added and they are now ready to be put to the rugged test. These durable “Back-Pack” products are sure to stand the test of time. For the “State Paws” design line we now have over 40 states released and ready to roll.Tennessee and Texas have been a huge success. In case you haven’t seen these designs, they are state flags replicated with paw prints and dog bones instead of stars. These designs show the love of your state and your pooch. This year we plan to fabricate leashes, collars, T-shirts, magnets, decals, and doggie T-shirts in your state! Please check us out on Facebook @poodooleash to see a list of upcoming Arts and Craft festivals we will be attending. Most are dog and family friendly.